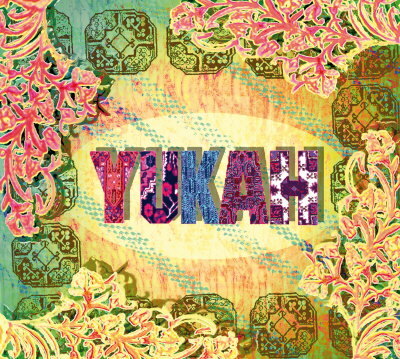 Yukah – the first CD of the equally named band. It sounds just what it looks like: radiant, colourful, and cosmopolitan. Burkhard Frauenlob’s project is vibrant with energy and zest of life. Many of the musical ideas originate from spontaneous jam sessions with the Brazilian bass player and guitarist Toni Porto on mutual tours with Hubert von Goisern. Frauenlob has already recorded a record with Porto, who is primarily responsible for the music’s peculiar Latin touch. “Magou” is the track adding the African element to the record; besides the vocal group Insingizi and the exceptionally virtuosic balaphone player Mammadou Diabate from Burkina Faso this song features a guest performance of Hubert von Goisern. Thus “Magou” is the only number with a vocal part: “Also without word, music makes a statement”, Frauenlob states and it is this message that is central for him. In trying to fulfil the seemingly unattainable claim of making “music for all audiences” that should, however, not sound commercial, Frauenlob has made a carefully considered choice in musicians to re-frame his (musical) ideas. Burkhard Frauenlob, the band’s initiator, shapes the album’s character by way of his melodious performance with distinctly percussive elements as well as with his compositional style: Most of the tracks were penned by him and reveal the well-rounded, expressive composer and pianist. Gernot Strebl on soprano- and tenor saxophone adds a particularly lyrical note to the CD with his expressive play. As becomes audible in his composition “New Games”, Strebl is rooted in jazz. Klaus Ambrosch (g) can show the subtle delicacy of his play to its best advantage in his own two numbers. Yukah’s rhythmic base is formed by Wolfgang Klingsbigl on bass, Wolfgang Tozzi on drums, and the percussionist Ismael Barrios, all of who are not only Latin specialist in their own right but ingenious in their interplay. An ethno-style album of truly high musical value that is tremendously catchy.